In The Company you play an employee of The Company an elite independent Private Military Service Provider, a global security concern capable of dealing with any situation from a high octane firefight to the tracking down of serial killers. If you can think of it, The Company can handle it. Please note this title is currently out of stock here, but can be bought from DriveThruRPG.com. Ever wondered what it is like to jump out of an aircraft 50,000 feet above a stricken oil tanker? Or how youd handle defusing an IED? Or what it is like standing between a visiting VIP and that snipers bullet? Well now you can because The Company will put you right at the centre of the action. 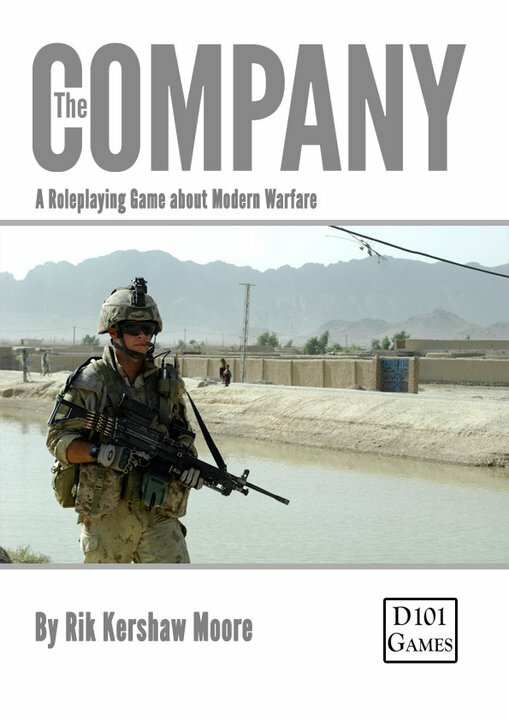 This 216 page Roleplaying which puts you in the boots of a member of The Company. Play a solider, a pilot, a surveillance officer or any other concept you can dream up that fits the setting. The game uses a modified version OpenQuest, a straight forward d100 system, with extra rules to handle Guns, non-lethal weapons, mental trauma and Vehicles. It also contains pages of World information about Trouble hot spots, terrorist organisations, and Competitors to the company. A skill-full blend of real world information, written by someone who has worked in the UK Defence industry, and game-able fiction. Operation Bluebeard – A seemingly straightforward mission to parachute out of a Osprey onto an oil captured by Somali pirates and rescue the crew. Operation F.I.S.H and C.H.I.P.S – As part of a Assault Group Maximum unit protect A.I.D.S charity workers in war torn Africa.